When 1560 The Game (KGOW, 1560 AM) flipped on the switch in 2007, they began with the mission of being a unique, locally-owned and managed sports and entertainment radio station. The station focuses efforts on being user friendly, accessible, and just plain fun. Much like the Saint Arnold Army, 1560 (by way of John and Lance) have somewhat of a cult following (stream them online here). Unsanctioned bar golf tournament? Check. Unannounced middle-of-the-night shows? Obviously. Slapfest? Yep. 1560 shirts at Academy Sports and Outdoors sold at cost? Outstanding idea. By their first year, folks were on board… big time. 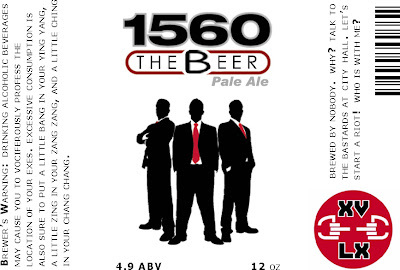 In what is a story for another blog post, several months ago I spoke with the program director for 1560 about another out-of-the-box idea: 1560 The Beer. Like the Saint Arnold Army, 1560 has a large a dedicated group of followers too, The Secret Society. Unlike Saint Arnold, 1560 promotes a wide variety of sponsors... and many of them are food/drinking establishments (Ragin Cajun, Nick's Place, Jake's Philly Steaks, Demeris BBQ, The B.U.S.). Apparently 1560 The Game discussed the idea with two other Texas microbreweries prior to my conversation with them. Presumably because of the uncertain nature of the venture and small batches that would be required, each shied away from the idea. Being an investor of Independence Brewing in Austin, TX, I suggested the two meet regarding the potential new partnership. Both Independence and 1560 are a good match because they both do more with less… and do it well. I know what you are thinking. When can I expect to pick up some Independence brewed 1560 The Beer out at the Ragin Cajun? Probably the day after never. Alright… let's see the restrictions. Beer isn't good for you. Got it. No "10 Times Better than the Pee Inbev Anheuser-Busch is Serving You" beer. Fair enough. "Naked Pale Boy" is out. No harm no foul. They probably could have wrapped this into #1, but whatever. Wow! This is getting *really* repetitive, but it's pretty straightforward. Maybe the TABC isn't as evil and destructive as I thought they were. Now what now?! Look at the size of #6 compared to the other restrictions! This doesn't look so good for 1560 The Beer. Are we done yet? (7) any statement, design, device, or representation that the malt beverage is a special or private brand brewed or bottled for, or that includes the name, tradename or trademark of any retail licensee or permittee or private club registration permittee. Craaaap. But is the TABC doing the right thing? Are they protecting the consumers for the greater good of society? Will 1560 The Beer change life as we know it? What would happen to the market if there was a (properly labeled) Walmart lager? A Steve Job's hard apple cider? A Houston Astros bitter? Would everyone hop into the beer contracting business if the code was revised? Would the market for beer somehow grow based on labels alone or is the alcoholic beverage market relatively fixed (maybe more tied to the economy)? Would the consumers be so confused that they started buying beer instead of corn syrup sweetened iced tea? Would there be an explosion of underaged drinking? Look, I get restrictions 1-5. I get portions of restrictions 6 and 7. I just don't get what the TABC is protecting by not allowing a 1560 The Beer. Does InBev not produce beer in their mega-breweries and label it as if it came from a local brewery that doesn't exist? Seems like that bends restriction 6 just a bit. Still not convinced that there is a problem with Texas' labeling code? In Texas, any beverage made from malted grains under 4% ABV can be called "beer." However, the same laws say that any malt beverage over 4% ABV is an "ale" or "malt liquor," no matter the style of beer. For the record, "Ale" and "Lager" actually refer to the type of yeast used and have nothing to do with the strength of the beverage. Most likely your Oktoberfest (a lager) you pick up at Whip In in Austin or Specs in Houston has "Ale" somewhere on the label. Apparently the word "bock" is OK to describe 4+% ABV beers in Texas though. A quick google search about bocks revealed that Celis (formerly of Austin, TX) used to call their Pale Ale a Pale Bock for labeling reasons... nice one TABC. And I'm sure I'm not blowing the cover off anything here, Shiner Bock is not actually a bock beer. Too many questions… not enough answers. It's enough to make me want to forgo the beer and hit the wine fridge tonight while I watch The University of Texas play LSU in the College World Series. 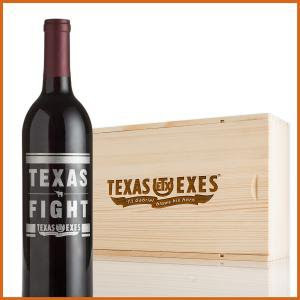 I think I'll pop open that bottle of "Texas Fight" that I've been saving for a special occasion. Take that label-nazis! I love the post. You should call me again. I have new fantastic ideas that pass the TABC muster. Get ready for a Kid Rock beer folks! According to this article, the contract brewed American Badass Redneck Lager has big money backing it.